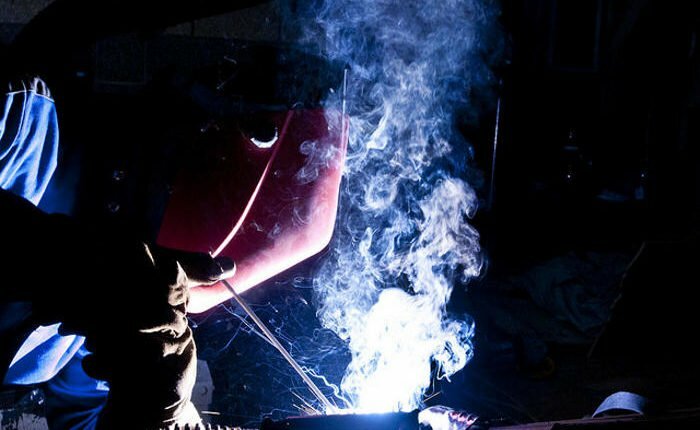 Welding gasses and fumes can be dangerous to anyone who breathes them in. A different mix of gasses is emitted with every welding project. These gasses can cause adverse effects on the body depending on the duration of exposure. The best way to protect yourself is to keep your head out of the smoke while welding. To find out more about how to reduce welding gasses and fumes exposure, read below. Welders have a greater risk of being exposed to welding fumes, but anyone working near them might also inhale these fumes. This is more likely to happen when working indoors or in enclosed spaces. Because the air can’t dissipate, the fumes can accumulate to a dangerous level. This means that anyone working in an enclosed space with a welder is exposed to the same level of risk. Short-term exposure can cause irritation of the eyes, nose and throat, dizziness, and vomiting. Long-tern exposure can cause occupational asthma, pneumonia, cancer, and kidney or nervous system damage. To lessen the hazards of being exposed to welding gasses and fumes, there are many risk controls that can be implemented. The most effective way is to eliminate the source of the hazard, if possible. If not, other ways are listed below, arranged in order of efficiency. Start choosing your next steps by asking the questions following each control. The most effective risk control is eliminating the threat by replacing or substituting a safer method or material. Can a less dangerous material be used? Are there other ways that create fewer gasses or fumes? Changes to the facility, machinery, and methods used can greatly lessen exposure. Can fans be installed to keep the smoke away from welders and others? Administrative controls include changing the rules and regulations, distributing awareness materials, and training workers. Is there an exposure control plan known to workers? Have workers been a part of a hygiene awareness program? The least effective control is personal protective equipment. It’s very important to use at least one other control in addition to PPE. Are workers always wearing complete & appropriate personal protective equipment? Are respirators fit-tested for each employee to ensure effectiveness?